Shearling coats and jackets are easy to take care of, although you do have to keep in mind a few things to avoid accidental damage to them. Click images to see our selection of Shearling coats. If your shearling coat or jacket gets wet, let them coat dry naturally. Don't place by a fire or other high heat source. Heat can dry out the natural oils in the hides. Do not wash your coat or jacket in a washing machine or put in a dryer. Most shearling coats are meant to be dry cleaned. When looking for a dry cleaner, make sure that they know how to properly clean them. The process must include putting the natural oils back into the hides. Without doing this process, the hides will dry out and the coat will be ruined. When hanging your coat or jacket use a sturdy, well shaped coat hangar. Don't use a wire hanger that's going to put "pokies" in the shoulders and don't hang it up on a knob for extended periods of time. Avoid stain resistant treatments that are made of silicone. We recommend Meltonian brand Protect-All. It will give you a layer of protection without changing the color or finish. Do not put adhesive stickers on shearling coats or jackets, as part of the adhesive can either get left behind or the adhesive may itself pull off some of the fabric. Never place your coat or jacket right next to a open fire or other strong heat source, such as a heater. The high heat from a fire or heater can damage the coats.. Also, do not store them in direct sunlight as it can bleach them over time. When storing your coat or jacket, never put them in a plastic garment bag for any sort of extended time because they need to breath. Cloth garment bags are highly recommended for both storage and travel. You can choose to have coat stored over the summer but most people tend to keep them at home in a climate controlled room and this seems to work fine. Never put them in the attic or basement for storage. Click here for more information about our shearling coats. 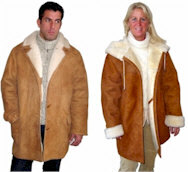 Our family has been in the sheepskin business for over 35 years, manufacturing most of our own products. All our sheepskin products are guaranteed against defective workmanship and materials for the life of the product. If you have any problems with them, simply return them to us and we'll make the necessary repairs at no cost to you. You've come to the right place, if you're looking for a sheepskin, fur or leather garment at outlet prices.